Devlin, Ryan Christie and Gary Mackay-Steven have been added to the Scotland squad ahead of the friendly with Portugal. 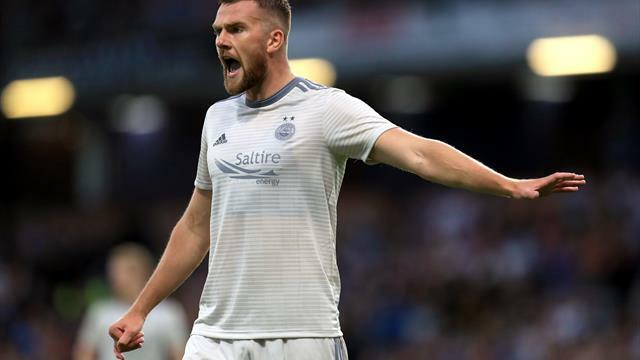 Aberdeen centre-back Michael Devlin has earned his first Scotland call-up after three defenders left the squad ahead of Sunday’s friendly against Portugal. Charlie Mulgrew, John Souttar and Kieran Tierney – the three players who started in central defence in Israel on Thursday – have dropped out along with winger Robert Snodgrass. Celtic’s Ryan Christie and Aberdeen winger Gary Mackay-Steven have also been called up for the Hampden encounter. Tierney has been rested after playing his 22nd game of the season in Thursday’s 2-1 Nations League defeat, while the other three withdrawals wee all due to injury. Mulgrew went off at half-time in Haifa while Souttar was about to be substituted before he was sent off. Manchester United midfielder Scott McTominay remains with Alex McLeish’s squad despite missing Thursday’s game with a minor knee injury. Former Hamilton captain Devlin has made 11 appearances for Aberdeen this season after missing the entire 2017-18 campaign through injury. The 25-year-old could feature alongside Dons team-mate Scott McKenna in central defence. Celtic’s Jack Hendry is the only other centre-back in the squad. Christie has won three Scotland caps over the past year while 28-year-old Aberdeen winger Mackay-Steven made his only full international appearance to date almost five years ago, when he came on for the last six minutes of a goalless friendly against the United States.